GOAL was founded in Lima (Peru) in July 2002 during a successful initial meeting of organizers and interested Latin American alumni under DAAD sponsorship. Active GOAL members on the Latin American side amount to nearly 130 professionals from 14 Latin American countries: Argentina, Bolivia, Brazil, Chile, Colombia, Costa Rica, Cuba, Ecuador, Mexico, Nicaragua, Paraguay, Peru, Uruguay, and Venezuela. Our Organizing Team is comprised of a National Coordinator from each country (see Member page) and two coordinators in Germany, Professors Jörg Matschullat and Klaus Stanek from the technical university TU Bergakademie Freiberg (see our Contact page). 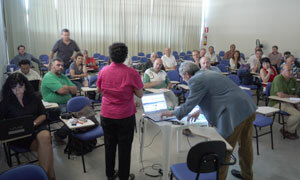 The link between the Coordinators is carried out by our Regional Coordinator for Latin America: Prof. Reinaldo García. GOAL acknowledges not only the generous support by DAAD, but also the initial network support by Professors Heinrich Bahlburg (University of Münster), Christoph Breitkreuz (Technical University Bergakademie Freiberg), and Hans Gursky (Clausthal University of Technology), as well as the feedback and encouragement from colleagues and Dr. Hanns Sylvester (DAAD).